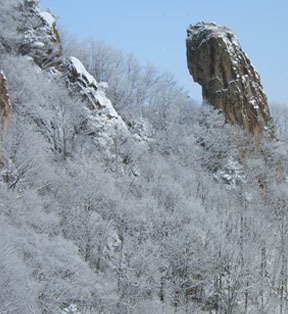 As the name of the rock, Dongsim means ‘childlike’ or ‘innocence’, it is said that anyone who sees this rock returns to the innocence of childhood. 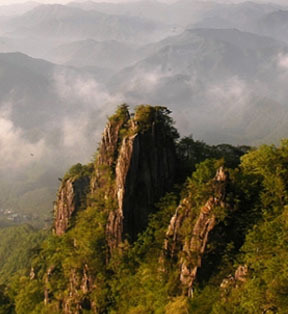 Legend has it that Wonhyo, one of Korea’s great ancient monks during the reign of King Munmu of the Shilla Dynasty was greatly impressed by this rock and stayed and prayed under it for three days right after he first saw it. 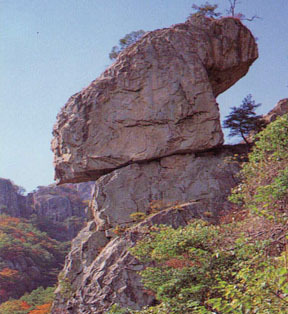 This touch-and-go looking rock is assumed to have stood there at least for 2,000 years from the time of Shilla Period. Kwon Yul, a Korean Army General led the Korean defenders against the Japanese forces and won a sweeping victory in the battle of Baegogae Pass during the 1592 Japanese Invasion of Korea. 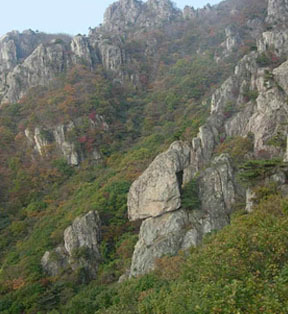 The battle site is named Janggunbong Peak as it resembles a general in armor and the rock is called Janggunbawi as it looks like a general bowing to the north where the king resided. 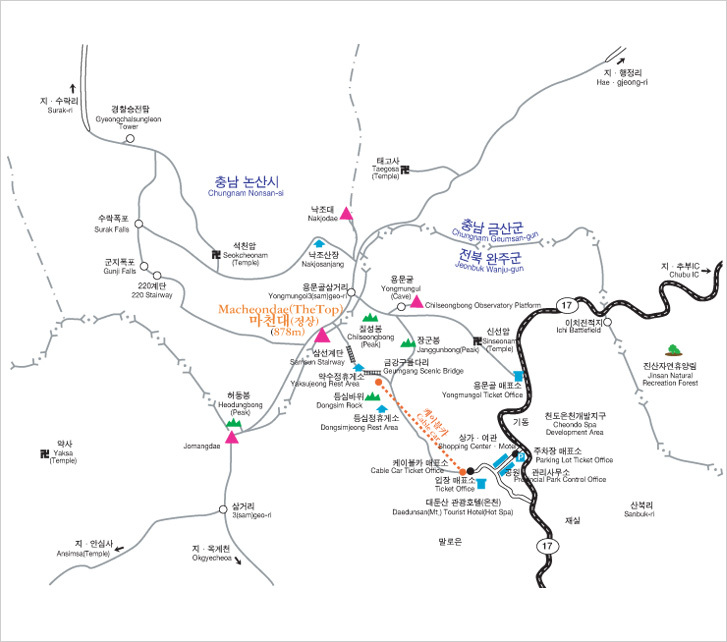 Seated in Gyo-dong and Pungnam-dong, Wansan-gu, Jeonju-si, Jeollabuk-do, the village was naturally formed as a reaction against Japanese merchants entering the town castle when it was broken down during the Japanese colonial period. It has been remained just as it was until today. 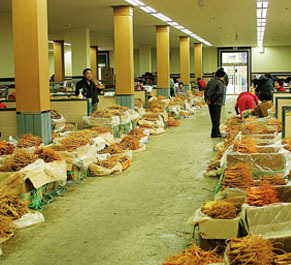 Geumsan Ginseng Market, which accounts for 80% of the nation’s ginseng production and distribution, is by far the center of the global ginseng business. 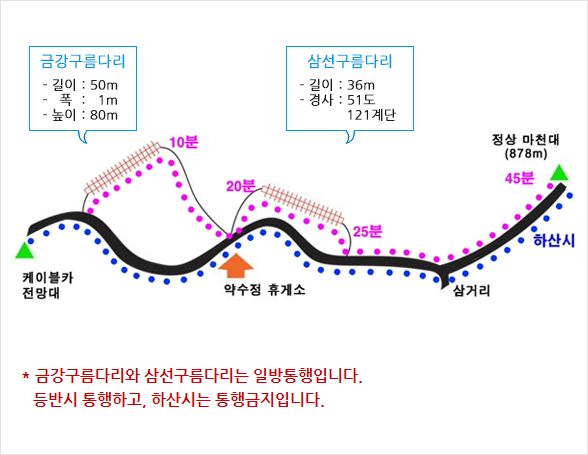 신라 문무왕 때 국사 원효대사가 처음 이 바위를 보고 발길이 떨어지지 않아 3일간을 이 바위 아래서 머무르며 기도를 드렸다는 전설이 있는데 이 동심바위는 금방이라도 떨어질것 같은 아스라한 모습으로 최소한 신라때부터 2000년을 버티어 온 것으로 추정된다. 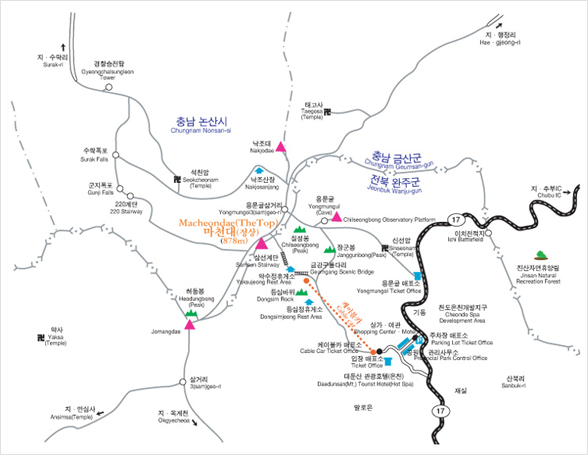 Jeonju Hanok Village: Seated in Gyo-dong and Pungnam-dong, Wansan-gu, Jeonju-si, Jeollabuk-do, the village was naturally formed as a reaction against Japanese merchants entering the town castle when it was broken down during the Japanese colonial period. It has been remained just as it was until today. Company. 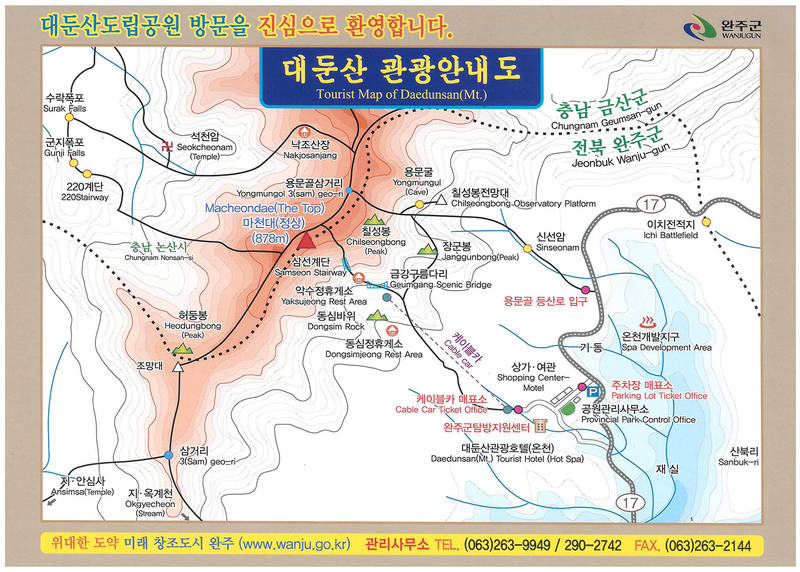 Yangji Daedunsan Cable Car Co.,Ltd. Address. 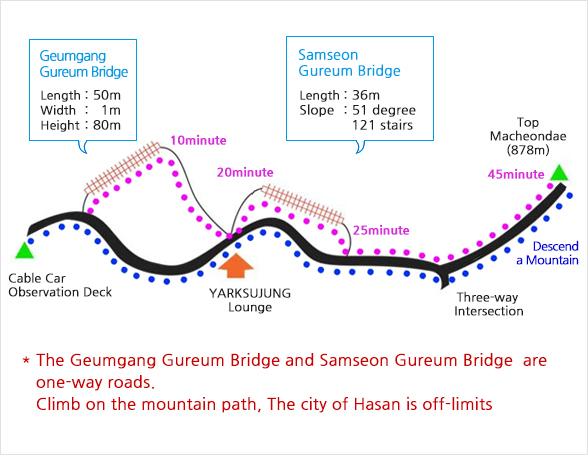 23-30 Mt, Sanbuk-ri, Unju-myeon, Wanju_Gun, Jeollabuk-do, Korea, CEO. 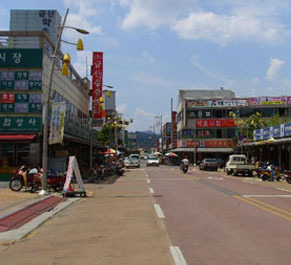 Choi Hyeong-jun Tel. 063-263-6621~2 Fax. 063-263-6638 COPYRIGHT ⓒ DAEDUNSANCABLECAR. ALL RIGHTS RESERVED.